Because Sodium Hypochlorite (Bleach), is a strong oxidizer and oxidation reactions are corrosive and can cause harm to humans it’s extremely important that you store bleach safely. Hypochlorite (Bleach) is most commonly used as a disinfectant or a bleaching agent. Common industrial usage includes the sanitation of food processing equipment and food contact surfaces, as well as water management. Bleach is also very common in most households and can be considered a household hazardous waste. 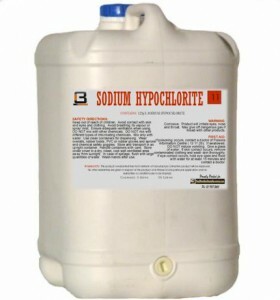 Sodium Hypochlorite is used, in households, for the removal of stains from laundry and a disinfectant/cleaner for surfaces. 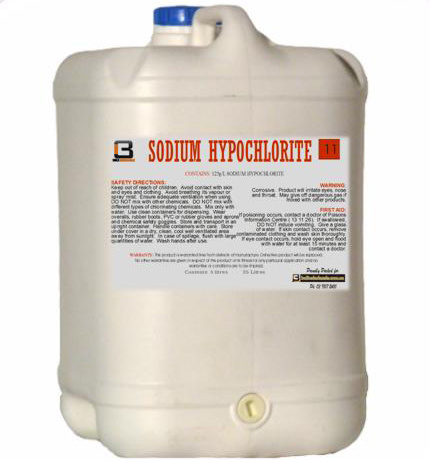 Sodium Hypochlorite is widely used for water treatment applications by disinfecting drinking water or water systems. Also, commonly used as a biocide in industrial applications to eliminate grime and bacteria formation in water systems. The chemical, Sodium Hypochlorite (Bleach), is a strong oxidizer and oxidation reactions are corrosive and can cause harm to humans. Hypochlorite can burn the skin, cause severe eye damage and hospitalization if consumed. When dealing with large quantities of Hypochlorite, it is necessary that the chemical be stored in a safe and compliant storage building. U.S. Chemical Storage offers fully compliant and secure chemical storage buildings for your Hypochlorite storage solutions. Hypochlorite (Bleach) chemical storage buildings should have proper ventilation installed for increased air flow. U.S. Chemical Storage offers customizable accessories for your specific Hypochlorite storage solutions. Make sure to properly store your Hypochlorite (Bleach) with one of our fully compliant, 100% customizable chemical storage buildings.